M. McLuhan shone a spotlight on the importance of the communication medium that shapes or at least colors the message being expressed. When it comes to the daily browsing of flickr.com/explore and persistently being distracted by technical aspects, rather than to enjoy the subject matter or the composition, several facets stand out, again and again. Doing a simple search for “landscape” and then selecting the filter for licenses set to “no known copyright” brought up a pageful of images, mainly in color. It did not take long to spot 10 irritants that get in the way of my viewing engagement with a subject and what the photographer expresses through composition and moment of release. Finally, since the language for understanding or comprehending plays on the language of seeing or vision, perhaps there is a useful extension to make from this discussion of the things that get in the way of plainly seeing and enjoying a scene. Just as there are a number of minor things that detract and distract from viewing a composition, so too in one’s waking consciousness there are a variety of things that singly or in combination cause a person to dwell on incidental details and miss the big picture. Distraction can come from financial constraints or loss avoidance, social status or relationships in distress, consumer dissipation, health preoccupations, unpredictable rule of law and social (dis)order, and so on. Drawing on the logic above and in an effort to minimize the distractions, it makes sense to strive for a simplified, streamlined life experience with relatively few moving parts and a least restrictive environment; one where the path from one’s dreams to reality has least friction and most supporting infrastructure ready to use. The principle is the same, whether it is searching through sets of images at flickr, or seeking pathways to fruitful living in one’s waking experience: distractions are many and the things competing for your attention only seem to multiply. Acknowledging this situation is the first step to mindfully guarding against things that get in the way of fully and truly seeing. Categories: hardware, heartware, software, Uncategorized | Tags: distracted, flickr, human eye, marshall mcluhan, medium is the message, panorama, stitching, technical distraction, visual experience | Permalink. Modern life and the ruts of familiar schedules and seasons add up to a state of mind very often distracted; the proportion of signal (the part you seek or express) to noise (the part you best want to avoid) seems to grow fainter with each new product or service that urgently attracts your attention away from the deeper and more lasting things in your life. To cut through the noise surrounding your daily living there are a few ways to refocus or reframe the push and pull; to turn down the noise and turn up the signal. Using a lens of historical or archaeological vision is one way to see through the current layers of life to discover traces of people’s lives and decisions during other times on in other places. Seeing the world through a historian’s eyes (cf. cobblers view the world in terms of shoes; nurses in terms of health needs; bankers in terms of opportunities to lend or collect potential depositors, and so on) is another way to foreground a distant time and to escape from today’s advertising hype or from the worldview carried in accustomed habits of shopping, using and disposing of things. Another way is to fall back on the distinction the ancient Greeks made between the human interpretations (nomos; culture/society) and the brute facts (physis). By foregrounding the physical side of events, the clamor of cultural meanings and intentionality fades to the background, which results in a refreshing release from those nominal interpretations or assumptions about an event or a practice. 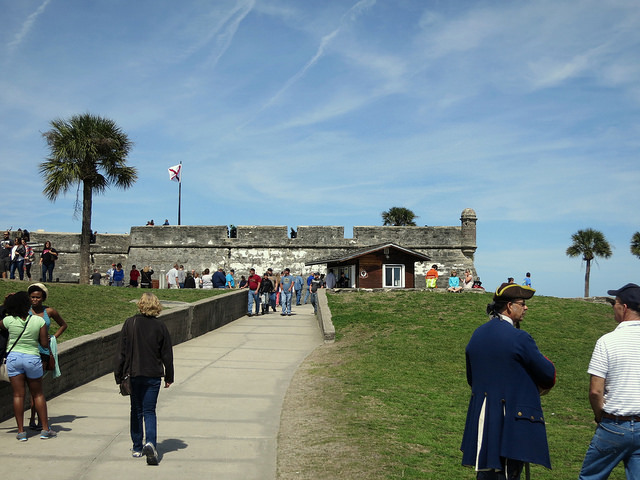 This photo from early spring in north Florida (St. Augustine, then celebrating 500 years since European inroads to the New World began on their beach) shows a history reenactor (lower right) talking to a visitor while many others are filing into or away from the old structure of San Marco castle. The ticket and tourist information station is in the middle background, staffed by the US National Park Service. The relationships that people develop between past and present; and between past and envisioned futures will vary by generation, gender, ethnicity, level of education and income, not to mention temperament or personal interest. For some it is appealing to visit the past (David Lowenthal’s book, The Past is a Foreign Country). For others it is engaging to raise one’s awareness of the past when viewing the landscape; to be sensitive to traces of things from long ago that persist today as silent witnesses to those long-ago times. Still others may consider historical settings as a charming and non-dangerous backdrop to one’s own life story. But no matter the motivation and depth of interest, there is value in seeing things hearkening to the past that most people haven’t much sensitivity toward. Categories: heartware, social observation, Uncategorized | Tags: consumer, historicity, history, modern life, san marco, signal to noise ratio, st. augustine, tourist, world view, worldview | Permalink.